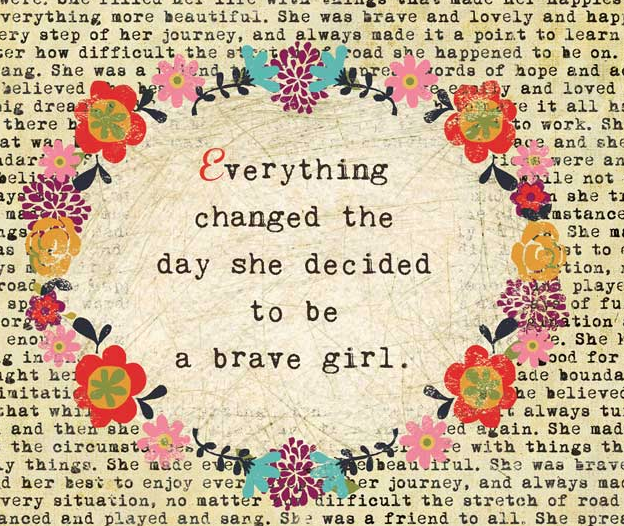 If you have arrived from my friend, Janet Joehlin's, blog you are on the right track! You have made it to the end of the hop! If you are just visiting and would like to start at the beginning of the hop please follow along with the list at the end of the post. Let me just start out by saying I love Sue and couldn't be happier to participate in this hop! Carolyn Dube and I try to spend time with Sue anytime we know that she will be in the same location as us as you can see in this photo below! That day was FILLED with memories! So.....what stencil to use??? I love them all by Sue but have never publicly used one of her Loose Dresses so this was the time! After a little breakdown because I couldn't find the stencil I got started true to form at the last minute. 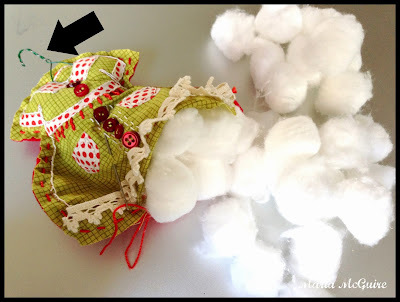 When I tell you that you CAN still make one of these for a gift I am not kidding! NO sewing machine required and less than 2 hours start to finish--less if you don't want to do the embroidery work. I used Sue's Loose Dress #2 6" x 6" stencil from StencilGirl Products and gathered some simple supplies. Scrap fabric and felt, craft wire, buttons, cotton balls (no stuffing in this house to be found), permeant ink pad/alphabet stamps and some embroidery floss. I traced the stencil onto a green piece of fabric with a regular marker. Perhaps I should have used something not permanent...but that is okay. 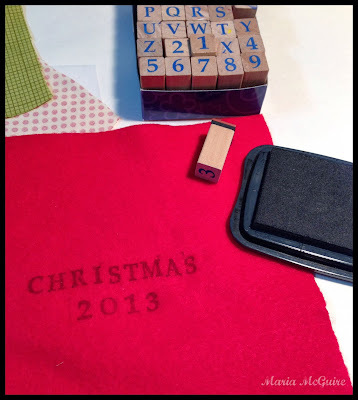 I also used a permanent ink pad and some cheap alphabet stamps to stamp out Christmas 2013 on the red felt which I later embroidered over using a simple outline stitch. I took a small piece of craft wire and bent one into a make shift hanger to put between the front and the back of the dress before I stitched it up. Not seen in the process, I traced the collar, waistband and cuffs onto the red/white polkadot fabric and fused those pieces onto the green. I also cut out some pockets to add to the design. Now I have the perfect ornament on my tree to remind me of Sue and the fun I had with her in 2013! 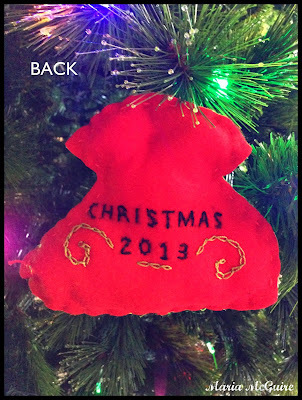 Here is a look at the back of my ornament. I hope you enjoyed the HOP! today. Not required, but I would LOVE if you would follow me on Bloglovin or Pinterest! StencilGirl Talk YOU are here! Sue Pelletier GO here NEXT! An unusual and VERY appealing idea. Love it! What an adorable idea for a special little keepsake gift ornament (and of course I'll have to make one to keep for myself too). I love it Maria! Love this idea! Something to put on my list. Thanks. So much fun. While you and Carolyn both created ornaments using the same stencil, they are so different and each so wonderful in their own way. And this non-sewer might even give it a try! What a clever use of the stencil. Make a wonderful ornament. This blog hop has been so much fun. I love the ornament you made. Sue's stencil are so great. This is so sweet! Love the little hanger and the adorable fabric combination! You are so talented, Maria! This is a very unique idea on how to use the stencil thinking way outside the box.....I Love it!!! Love the ornament! 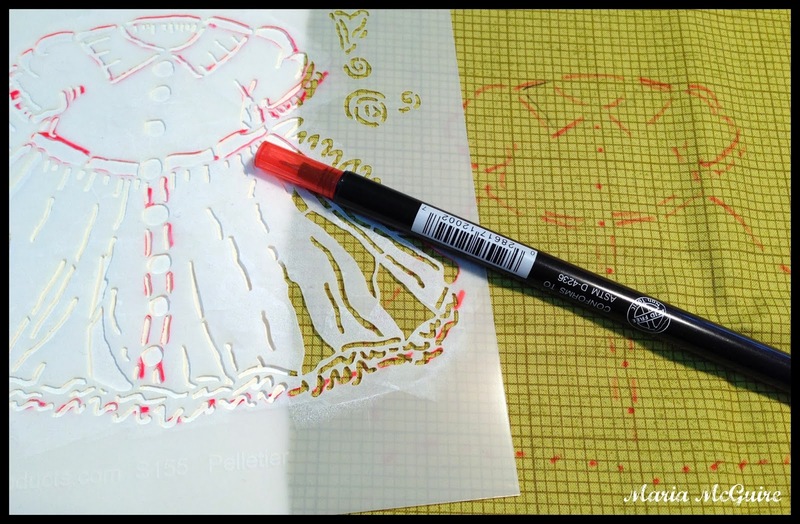 These dress stencils are so much like what I wore as a child! Very cute loose dress, loved your idea for an ornament! What a great use for all the fabric scraps I have taking up room and not being used! Intentions are to make a different dress ornament for each of the women in my life, and personalize them for each individual! You are right, they should take no time at all! Thank you for the idea of such a creative gift! Love the "hanger". Cute ornament. Your stitching idea is so creative and fun! Who wouldn't love to receive a special ornament like this!?? LOVE! This is so wonderful!!! Saw it over on fb 1st and fell in love with it! Great idea for additional uses for our stencils... thanks for sharing! Last, on the blog hop, but definitely not least - and just to make it clear there have been NO leasts!. Thank you for a great idea. This hop has been a delightful journey. The ornament is so cute using Sue's dress stencil. I would love to use Sue's stencils because they make me smile. Her loose women are my fave. Thanks for the opportunity to win a set. What a great ornament for a great memory! 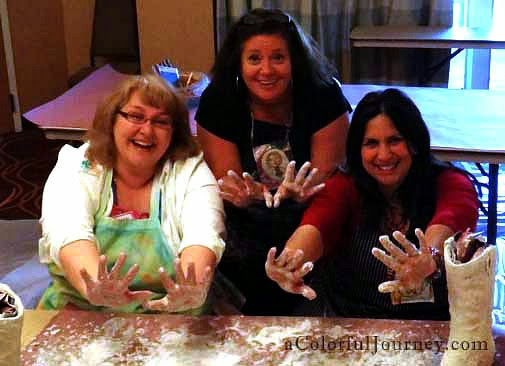 So amazing to learn so many new techniques on the Blog Hop. THX! You are very creative! And funny! Holy Smoke, I would never have thought to use a stencil to make an ornament, and it doesn't even look too scary to try! Great idea, great result! You rock! I love all the creative ways people are finding to use these stencils!! Love the ornament! Can't wait to try it for my granddaughters! Great ornament. I love the use of the stencil and the fun time making it. 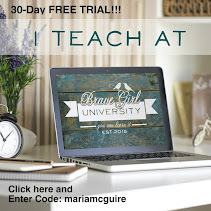 Great blog hop and so many different uses. I'm so glad I joined the stencil club. Receiving the stencils is like getting a Birthday present every month! 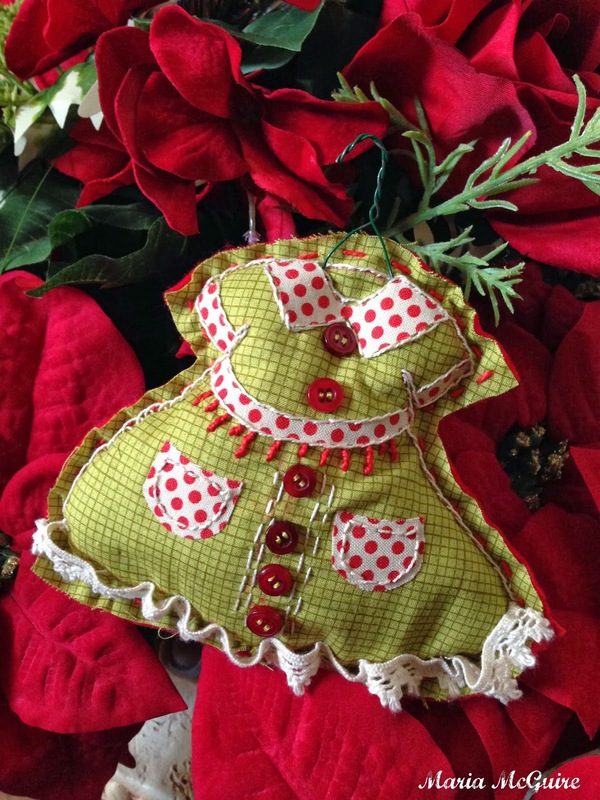 This little dress ornament is darling. I can't wait to make a few. 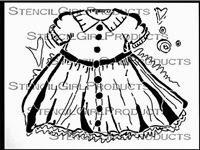 It would be cute to fashion one into a baby dress for a baby shower or wedding gown for a brides shower gift! My mind is racing :) Off to check out the rest of the Hop...TFS! Thanks so much for posting this! You've given me the idea to do something else with my stencils...off to my garage ! Cute ornament. Sounds like it is fairly easy and fast to make. Love that the back was marked with the date. Keepsake present. thanks for sharing. OH MY! 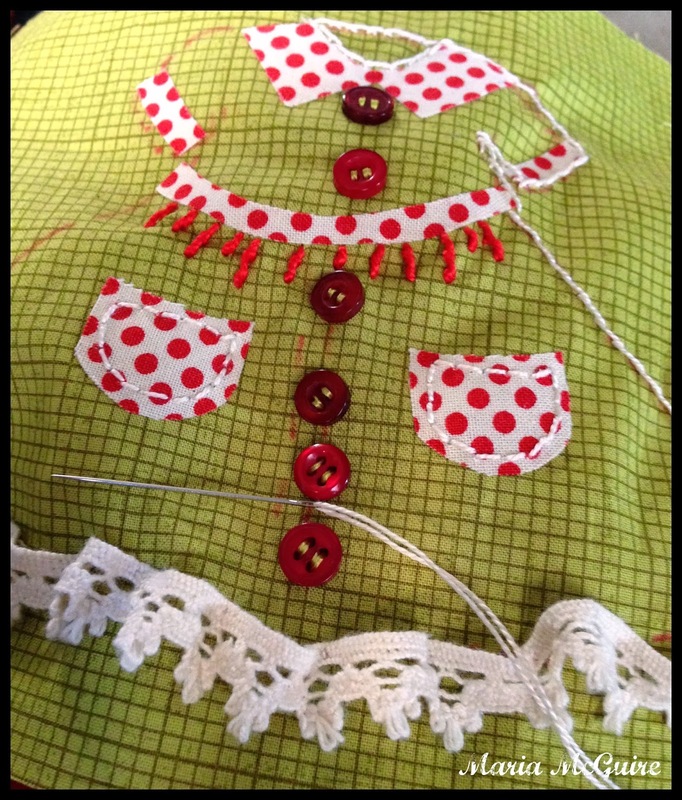 !...another super fun project using the doll dresses! !...great ornament!....This BlogHop has been the BESTEST! Maria, the little dress is adorable!! It reminded me of what my used to sew for my sister and I. Thanks for helping me bring back such joyous memories! Una idea estupenda la de rellenar de algodón y ponerlo en el árbol. Awesome ornament,especially since you had misplaced the stencil. How beautiful, Maria! Love this sweet dress.